In winter when I don’t need my florescent lights for seedlings, I use them to grow microgreens to add fresh crunch to salads and sandwiches, or to boost the nutrition in a breakfast smoothie. Microgreens are a little different from sprouts in that you grow them in seed starting mix or potting soil, and provide enough light to green up the first set of leaves. 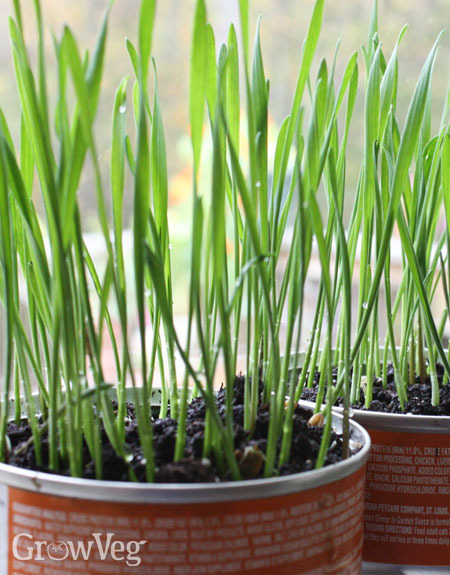 If you have no plant light, a bright yet chilly windowsill will make a suitable spot to grow little containers of rye or wheatgrass for cats, or perhaps little pots of peas. Many types of seeds can be grown as microgreens, but the best species have large seeds that sprout quickly. Sunflower seeds give the fastest results, and they are also fun to grow. Peas are easy, too, and all members of the cabbage family make great microgreens. As I have experimented with different seeds, one of the most delightful surprises has been popcorn. When grown as microgreens, popcorn shoots taste like succulent morsels of sweet corn. Microgreens are harvested by snipping off the sprouts at the soil line when they are a few inches tall. It is usually safe to use any certified organic seeds for sprouting, or you can buy seeds selected especially for sprouting. I usually use organic seeds from the bulk bins at my health food store when growing wheatgrass or sunflower microgreens, and raid my stored garden seeds when I want to grow a few peas or a micro-patch of mustard greens. The miracle of germination usually takes place below the surface, hidden from view, but not when you grow microgreens. Instead of burying the seeds, they are sown atop very damp seed starting mix or fresh potting soil, and lightly pressed into the surface. Place seeds only a seed’s width apart so the sprouts will hold each other up as they grow. Spritz the seeds with water, and place them in a warm spot where you can check them often to make sure they stay moist. I use either the top of my refrigerator or the flat top of my seedling lights as my germination spot, and cover the containers with several folds of very damp newspaper. I have tried using plastic or other covers, but I have found that newspapers dampened twice a day work best. The seeds sprout quickly under warm, moist conditions, usually within three days. Then I move them to bright light, and spray them with water often to keep the seeds and sprouts moist. Sunflower and sweet corn microgreens are ready in a week, peas and cabbage need 12 to 14 days, but some microgreens take longer. For example, beets grow into beautiful microgreens, but they can take a week to germinate, and another month to grow to harvesting size. Cilantro often pokes along, too. Because microgreens grow for such a short time, they do not need deep containers. Drainage holes are helpful but not really necessary, because microgreens are watered frequently from the top. However, I have learned that slow-growing species are easiest to water when grown in containers that do have holes in the bottom, because you can sit the container in a dish of water to give the roots a good soaking. Any containers that are small enough to fit on a window frame are handy for growing microgreens, too. Two winters ago, I grew some wheat and rye seeds into a patch of green, intending to feed it to my chickens. But the cats found it first, and they so enjoyed munching the tender grass that I now grow cat grass especially for them. The same wheat or rye berries you plant as cover crops can be grown as cat grass (or chicken or parakeet grass), or you can eat your wheatgrass microgreens by juicing them or adding them to smoothies. A few years ago, researchers at the Food Quality Lab in Beltsville, Maryland, tested the nutritional value of 25 different microgreens. One clear trend was that microgreens contain much higher levels of vitamins and carotenoids compared to the same plant’s mature plant parts – often five time as much vitamins A and C. The highest nutritional scores went to red cabbage, cilantro, red amaranth and green daikon radish. Buckwheat microgreens provide abundant vitamins and some protein, and they are as fast and easy to grow as sunflower sprouts. Growing microgreens is fast, fun, delicious and good for you. What are you waiting for?